Unfortunately this restaurant is closed!! 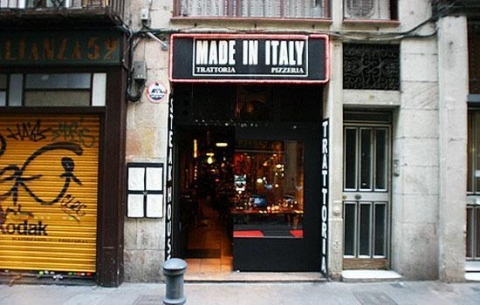 This small trattoria has been relocated from Chelsea in London to Carrer Ample in the heart of Barcelona´s Gothic Quarter, by the Genovese owner, Italo Sanguineti. The cuisine was different to other Italian restaurants in Barcelona, and serves traditional dishes made from products imported from the North of Italy, such as the Liguria region, Friuli and Emilia Romagna, as well as Sicily. Italo Sanguineti and Michelle Paolantonio serve great dishes inside a fine interior, which has a relaxed atmosphere with jazz music. The antipasti offers a wide selection of different Carpaccios, stuffed hors d’oeuvre and cheese, smoked salmon rolls with Mascarpone cheese, or the cheese salad, with nuts and honey. There was a wide selection of fresh homemade pastas like the Sorrisi Mediterranei al pesto rosso from Genova and Stracci ai funghi porcini, as well as pizzas and great house steaks, specially created by Davide Piccineli.